Thank you for your interest in volunteering for the One Earth Film Fest/City of Chicago Earth Day Mini Film Festival. Consider giving your time on April 22 or 27, 2019. This year, One Earth Film Fest's Earth Day week partnership with the City of Chicago showcases 4 engaging screening events -- with refreshments -- in Chicagoland. As a volunteer-based, nonprofit organization, we depend on the incredible generosity and talents of our amazing volunteers, who help run all areas of the festival. We hope you’ll join our team as we go ALL IN to spark action, grow hope and build community resilience for Earth Day week. Work with an amazing, energetic group of people. See highly anticipated environmental films that will inspire you. Engage with the community in thought-provoking discussions. Bring home practical advice that you can use right away. 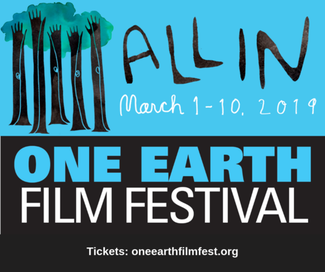 Receive your very own One Earth Film Festival t-shirt. Attend our fabulous Volunteer Celebration on April 28th 4-6P at Inspiration Kitchens in Garfied Park. Zero Waste Support (applies to events that involve food/drink) - setup venue and hang signs for sorting recycling and compost, guide attendees to sort correctly, cleanup. New and Improved: The start and end times listed in SignUpGenius reflect your specific volunteer shift. To learn the specifics of each role, see One Earth Film Fest Volunteer Roles. For easy training materials, see the 2019 Volunteer Toolkit. * SignUpGenius Hint - press CTRL and F to get a search box. Type in a key word or date to jump to specific events.